The farming community is renowned for its ability to rally together and show what it is really made of. And true to form, on Thursday, August 9, farmers united to take part in this year’s 24 Hours in Farming; a Farmers Guardian campaign aiming to highlight the work of the agricultural sector by posting across social media platforms throughout the entire day, using the hashtag #Farm24. Now in its fourth year, the event encourages people to join in in championing the nation’s food and produce, while taking a closer look at those who are at the core of the process. From 5am to 5am, dedicated FG staff manned the hot desk in-between participating in farm-themed fancy dress, fun and games. From the heart of the FG office, we witnessed what was a record-breaking and inspiring 24 Hours in Farming, with more than 5,000 contributors and support from politicians, TV personalities and chefs alike. Never before have farmers consolidated in such a way to inform, educate and speak from the heart about their lifestyle. From large businesses to small family farms, it was a day dedicated to letting people in agriculture have their say. On Twitter, the hashtag #Farm24 trended in the top four all day and received more than 114 million impressions; a staggering 12m more impressions than 2017. Throughout the course of the day, we were inundated with tweets, pictures and videos from Twitter, Facebook, Instagram and Snapchat, that can only be described as a fantastic celebration of one of the greatest and most historic professions on earth: farming. The campaign gained unbelievable traction, quickly attracting high-profile interest from outside of farming. There was a raft of appreciation coming from Government members, including Farming Minister George Eustice, Shadow Defra Secretary SueHayman and Secretary of State Michael Gove. Legendary Welsh rugby player Gareth Thomas, and well-known farmer’s daughter and BBC radio DJ Sara Cox also took to Twitter to thank the UK’s farmers, giving the campaign more momentum than ever, allowing us to reach out to those vital wider audiences. With a huge focus on food and the journey from farm to plate, this year’s #Farm24 provided consumers across the country with an opportunity to gain an insight into food production. The initiative, sponsored by Morrisons, was no doubt our most successful yet, proving that, as a force, farming can use its combined voice to help bridge the gap between the public and what they are eating. 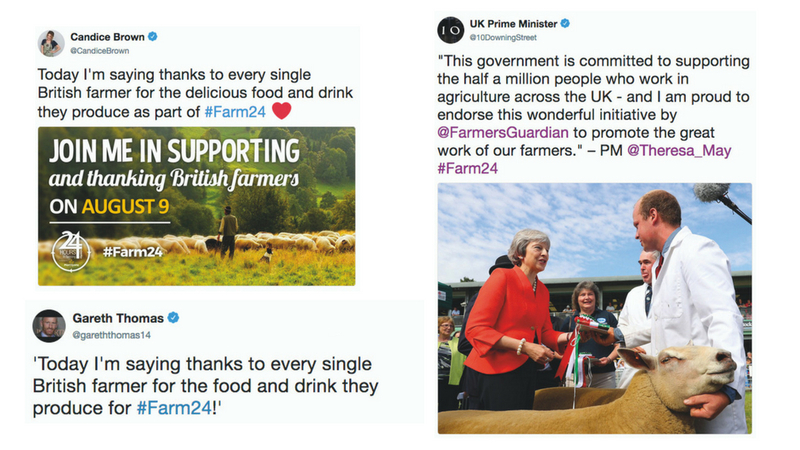 FG editor Ben Briggs said:“August 9 proved to be another wonderful celebration of the best of British agriculture and the #Farm24 hashtag dominated social media streams throughout the entire day. “To achieve more than 114m social media impressions on the 24 Hours in Farming day itself, 12m more thanlast year, was an incredible feat and shows the huge popularity of the #Farm24 initiative. The hype and passion surrounding the day was incredibly catching and, although the event outshone all thoseprevious, it is important to remember that as we celebrate just one day, the industry continues to work tirelessly around the clock throughout the year. Hopefully this event will shine some positive light on the relentless commitment and dedication our farmers have to producing the nation’s food, and those who supported them during 24 Hours in Farming might just continue to be advocates of the industry outside of the event too. Thank you to everyone who took part in the biggest ever 24 Hours in Farming. Morrisons is very proud to continue supporting the initiative, which showcases the work done across the nation by UK farmers to feed our communities and families. The day was a great success on social media and in our stores and helped communicate the importance of British farming to Morrisons customers. 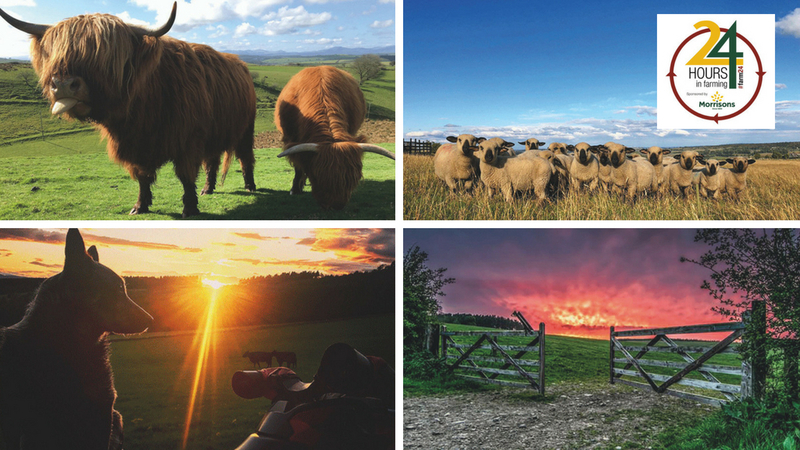 We look forward to growing the profile of British farming and we hope you will all join us in 2019 to make #Farm24 even bigger. Andrew Thornber, Morrisons Market Street and manufacturing trading director.